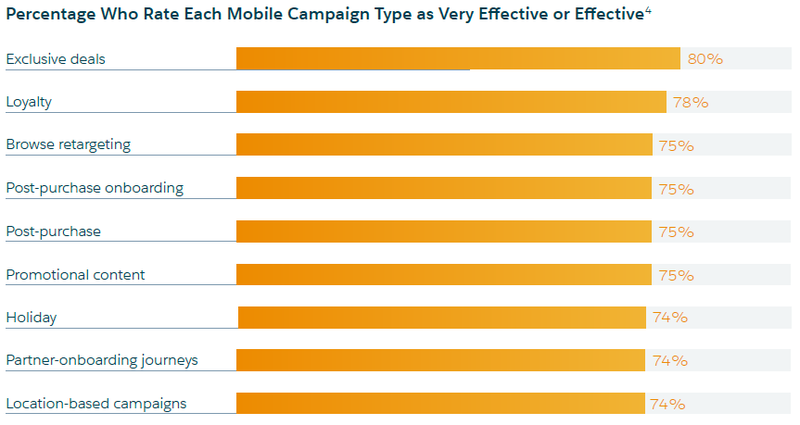 Today’s advertisers need to ensure the customer journey is central to their marketing efforts, and the ones who incorporate social media, technology, and cross-channel strategies into their plans will come out on top, according to Salesforce.com’s latest State of Marketing report, which was released this week. “If we truly put customers at the center of our thinking — considering how we can make any touchpoint delightful — it changes the way we approach… the tools available to us as marketers,” Scott McCorkle, CEO of Salesforce Marketing Cloud, wrote in the report. 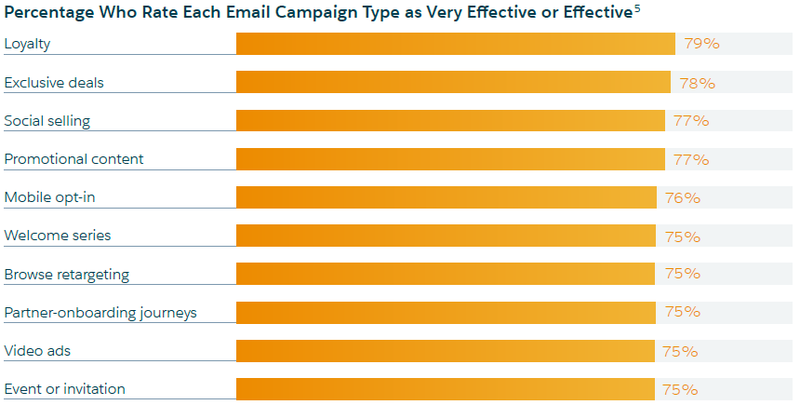 Email or phone data, which 83 per cent of high performers now use for targeted ads. To conduct its survey, Salesforce solicited responses from 3,975 marketers in 13 countries, with around 32 per cent of respondents based in the U.S. and between seven and 11 per cent each based in Canada, the U.K., Germany, Japan, Brazil, Australia, and France. The remaining two per cent came from the Netherlands, Denmark, Norway, Finland, and Sweden. The respondents all held leadership roles within their organizations, with approximately 26 per cent in business-to-consumer (B2C), 29 per cent in business-to-business (B2B), and 45 per cent in business-to-business-to-consumer (B2B2C), while their companies spanned over 14 industries, and were not limited to Salesforce customers. Salesforce defined the “customer journey” as all interactions between customers and a company’s brands, products, and/or services, regardless of channel, noting that high-performing marketing teams were nearly nine times more likely than under-performers to adopt a customer journey strategy. At least 70 per cent of respondents who had implemented a customer journey strategy said it had a positive impact on their customers’ willingness to recommend products and services, consumer engagement, and revenue growth. While many steps in the customer journey have traditionally been led by the sales or customer service teams, the best marketing teams are integrating them into a single path, the report says, with 63 per cent of high-performance marketing teams reporting collaborations with other departments such as sales, service, IT, and other executives. High-performance teams were also 3.3 times more likely than underperformers to use customer retention management (CRM) tools (with 35 per cent of underperforming marketing teams saying they have no plans to use CRM in the future), nearly eight times more likely to lead company-wide customer experience strategies, and more than 34 times more likely to take an omni-channel approach. Good news for the tech-savvy: you’re in good company. Salesforce discovered that 63 per cent of marketers at all levels (including the moderate performers who were “very or moderately satisfied” with their company’s marketing efforts and represented 68 per cent of respondents) plan to increase spending on marketing tools and technology over the next two years. That written, Salesforce researchers also noted that high-performance teams used more than twice the number of tools and technologies that underperformers did, and were more than four times more likely to use advanced tools such as marketing analytics, data targeting and segmentation, marketing automation, and predictive intelligence. This one should be a no-brainer, but only 31 per cent of underperformers and 41 per cent of moderate performers reported having an executive team that was “completely committed” to supporting their overall marketing strategy, versus 83 per cent of high performers. Tech-heads should also note that around 44 per cent of high-performance teams reported a willingness from their c-suite to “substantially increase” spending on digital marketing tools and technology. “When the commitment to marketing starts at the top, companies prioritize marketing and walk the talk with their investments,” Salesforce noted. “Your customers are cross-channel so your marketing must be cross-channel,” Salesforce writes, noting that at least 60 per cent of high-performance teams have integrated their company’s mobile, email, and social media marketing strategies into their overall marketing plans. By contrast, fewer than 30 per cent of moderate performers, and 20 per cent or fewer underperformers, reported similar integration efforts. According to the report, nearly 80 per cent of marketing leaders consider mobile marketing a core element of their business, and their efforts illustrate that commitment, with every type of mobile use monitored by Salesforce, including mobile applications, SMS, push notifications, and location-based mobile tracking, growing by at least 98 per cent between 2015 and 2016. Among those 80 per cent, half said that mobile marketing was directly linked to their company’s primary revenue source, while another 77 per cent said it generates ROI – a significant jump from the 31 per cent who said so in 2015. Thanks to predictive intelligence, established marketing channels such as email are enjoying a renaissance, with marketers able to leverage this new source of data to create personalized messages that, rather than being sent in bulk at scheduled times, can be used to respond in a way that increases customer satisfaction and loyalty. The number of marketers who said email directly generated ROI rose from 54 per cent in 2015 to 79 per cent in 2016. In 2015, three of the top five areas where marketers planned to increase their spending involved social media, and this year, those investments appear to be paying off, Salesforce reported, with 82 per cent of marketers now reporting social media marketing is a core aspect of their business, and 48 per cent reporting that it’s directly linked to their business’ primary source of revenue. The report also noted that at least 82 per cent of high-performance teams were likely to integrate their social media efforts with other tools and technology (ex. CRM), or with other social activities such as customer service. High performers were also 11 times more likely than underperformers to respond to social media interactions in a timely manner. Nearly two-thirds of marketers, and 80 per cent of high-performance marketers, will be increasing their social advertising budgets for 2016, Salesforce reported, making it the third-largest area for increased investment. Also worth noting is the popularity of data-driven marketing, particularly on social platforms, with Salesforce reporting that 91 per cent of respondents use customer data to target or segment their ads.